Puppy Games: Why You Shouldn't Play Chase With Your Puppy! 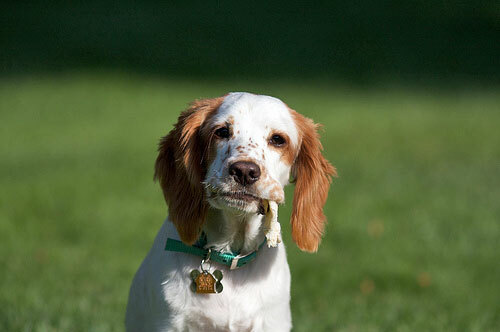 Playing puppy games can help to teach your Cocker Spaniel control and discipline, however, playing chase with your pet is not one of them and is best avoided. Read on to learn why. What's Wrong With Playing Chase Puppy Games? Puppies love to be chased and let's face it, this game sounds like fun, but don't be fooled. This type of puppy game won't teach your Cocker control and discipline, in fact, it will do quite the opposite. Chase me is not a good game to play with your puppy (just yet) and should be avoided until he's a little older and fully trained. You're never going to be able to catch him. (A young puppy is probably going to run faster and be more energetic than the best of us!). Once your puppy learns that he can out-wit you it may increase his 'perceived' dominance. It can lead to a boistorous, uncontrolled puppy. Because your cocker spaniel will almost always initiate chasing games, (and then you chase him) you will be pandering to his attention-seeking antics. Most of all, this game can be dangerous. 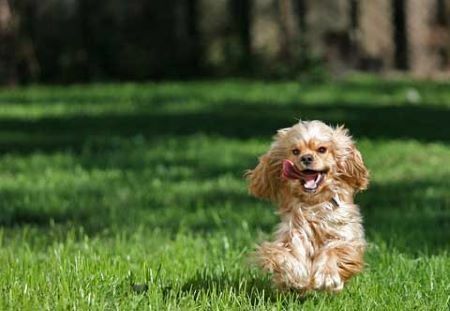 Your puppy will be so excited that he may be running 'blindly' and could run out in front of fast-moving traffic. In the interst of safety, you should be in control of your puppy at all times and never let him tempt you into playing chase. Does Your Puppy Tease You To Play Chase? Watch your puppy playing for a little while and note his behaviour. Does he pick up a toy, or something that belongs to you, and run away with it? Does he wait until you get near him before he picks it up and runs away again? If the answer's yes, he want's to play and he's trying to get you to chase him. Let's look a little more closely at an example and analyze his actions, shall we? Your puppy picks up your slipper and refuses to give it to you. He runs away with the 'spoils' and refuses to come back to you. You chase him in a bid to get your slipper back. By taking your slipper your puppy is 'stealing', and may be showing potential signs of possessiveness. Your puppy is learning that he has been 'allowed' to ignore your command(s) and he may try it on the next time you ask him to do something. This will only esculate and cause behavioural problems later. Your Cocker is also learning that he can manipulate you into playing puppy games with him, and that he can outsmart you because you can't catch him, or you can't retrieve your slipper from him. The danger here is that he's 'learning' to become more dominant and is beginning to undermine your place in his pack. And this is where owners begin to see behavioural problems developing. If your puppy gets loose and runs away, it's important that you don't chase him because you may never catch him, or get him to come back to you. If you chase after your puppy, he will think it's a game and will run away each time you get close. At the very worst, you may chase him into oncoming traffic! If your puppy does manage to get free, stay calm, call his name; don't shout, keep your voice light and appealing. When he looks back at you, turn immediately and run in the opposite direction, calling his name as you run. This may feel like that last thing that you'd want to do as you watch your Cocker Spaniel puppy racing away from you, especially down a busy main road. Keep calling him to you while you run in the opposite direction. It doesn't matter what you look or sound like! Your puppy will think it's part of the game and he will follow you. You can slow your pace a little and he'll soon catch up with you. Trust me, I've been in this very situation and it works! This should be the only time you allow your puppy to 'chase' you. Puppies who are allowed to chase people can grow to be boisterous, if not dangerous, adult dogs. I'm not saying you should never play chase puppy games with your Cocker Spaniel, I'm just suggesting you hold off until your puppy is fully trained. Then you can relax the 'no chase' rules a little, however; you must always initiate and end the chasing puppy play; your puppy should play by your rules.